Memorial Day. The kick-off of the summer grilling season. We wait all year for this day, don’t we? Well, I do. So I wanted to make a stellar salad with grilled shrimp and all my favorite salad veggies for this venerable holiday. 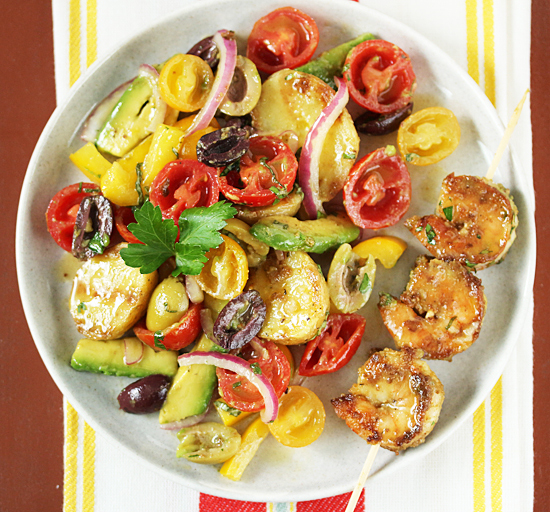 Not only tomatoes, avocado and grilled little potatoes, but also olives and red onion, plus a spunky vinaigrette. All you would need to complete this menu would be Soft Sweet Buttery Cornbread and Blueberry Pudding Cake. Oh yes. Having moved into an apartment at the beginning of the year, I no longer have an outdoor BBQ grill, so I have resurrected my big non-stick grill pan. 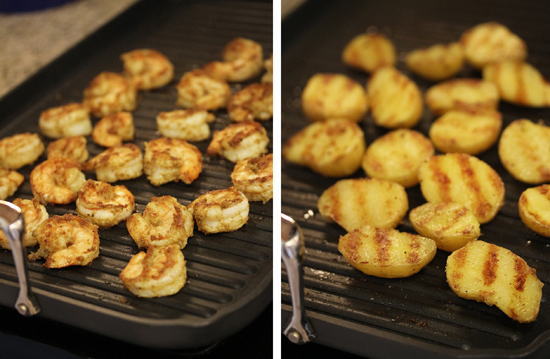 I was so happy with the grill marks it made on the shrimp and potatoes. 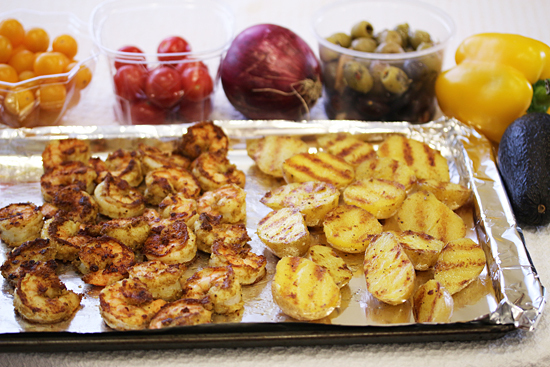 After grilling the shrimp and potatoes, I put them on a sheet pan while I prepared the veggies. Everything went in a big bowl to be drizzled with the vinaigrette which was gently folded in. 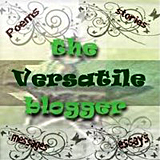 All those bright colors just send me and make me grin. Onto the serving platter and garnished with more Italian parsley for eye appeal. 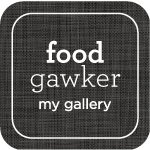 I love all the different flavors, the spritely tomatoes and yellow pepper, the salty tangy olives, the zing of the red onions, the herby floral notes of the basil and parsley, and the char on the potatoes. Then add the grilled sweet spicy shrimp along with the garlic-y white balsamic vinaigrette. I’m in heaven. I hope you have a wonderful holiday filled with family, friends and great grilling! 1. In a small bowl, whisk together the vinaigrette ingredients and set aside. 2. Cook potatoes in sauce pan in boiling water for about 8 minutes, until knife can be inserted with little resistance. Set aside on plate to cool. In same water, cook corn for about 5 minutes, if using. Set aside on plate to cool. 3. In a large bowl, mix together the ground fennel, mustard powder, ground coriander, salt and pepper. Add shrimp and fold with large spoon until shrimp are thoroughly coated with spices. Drizzle with 3 tablespoons olive oil, folding until coated. 4. Heat grill pan over medium high heat. Reserving bowl with excess oil, place shrimp about 1 inch apart on grill pan and cook until bottom half are opaque and have grill marks. Turn over and grill until cooked through, with grill marks. Set aside on sheet pan. 4. With a serrated knife, cut cooled potatoes in half lengthwise. 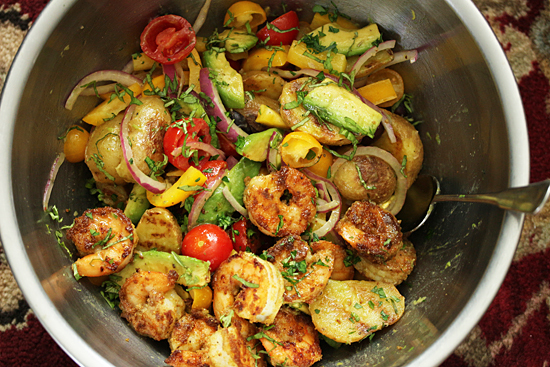 In same bowl used for shrimp, add potatoes and drizzle with 2 tablespoons olive oil. Toss to coat with oil. Dust with salt and pepper. Place on heated grill pan over medium high heat cut side down. Cook until grill marks appear. Turn over and grill until lightly browned on bottom. Set aside on sheet pan. 5. 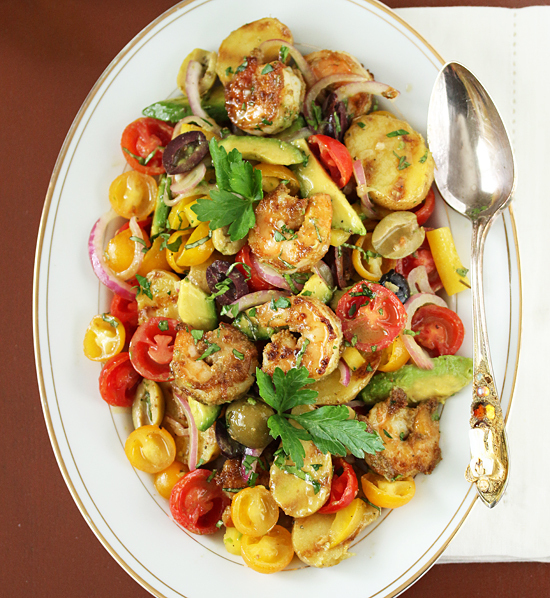 In large bowl, mix together potatoes, tomatoes, red onion, olives and yellow pepper. If using, cut corn kernels off cob and add. Mix in basil and parsley. Drizzle with vinaigrette and mix in. Adjust seasoning. 6. 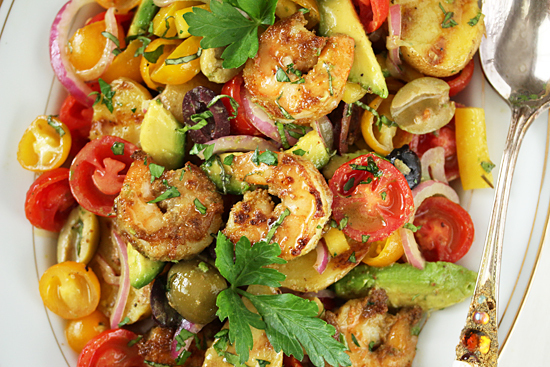 Fold in avocado slices and shrimp. Serve on individual plates or large platter. Garnish with additional Italian parsley leaves. Note: Potatoes and skewered shrimp may be grilled on BBQ or gas grill. You may use any spice blend of your choice on the shrimp (jerk, Cajun, favorite Penzeys blend). I can’t think of any combination I like better than his one. Looks splendid. What a beautiful salad – so colorful. Id be proud to bring this one to guests. And you worked wonders with your stovetop grill. Brava! What a masterful, colorful display! Palate meets palette. Great summer recipe and the pictures are great. I’ve cooked a similar dish for years but never used potatoes. I’ll have to give it a try.